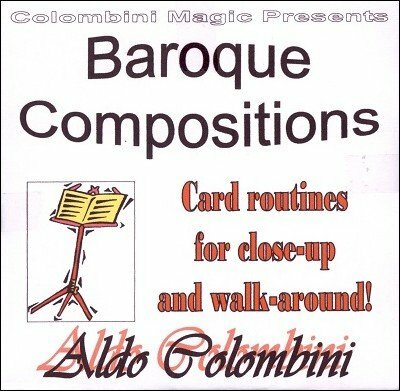 Here Aldo performs and explains twelve effects from his Baroque Cards ebook. The twelve effects were selected by Rachel. Vivace: You deal the Kings into four packets and they assemble in one packet. On top of each pile the four Aces appear. Aria: An Ace-Assembly that's easy to perform, direct and to-the-point, with a magical and surprising climax. Sarabanda: The two black Kings find two selected cards from a deck cut into three piles by a spectator. Concerto: The four Jacks disappear and find three cards in the middle of the deck. One indicates the value of a selection, the second the suit and the third is the selection. Cantabile: You produce a card that reveals the identities of three selections, and the selections appear face up in the middle of the deck. Maestoso: A card is placed between two Kings and all into the box. The same card appears on top of the deck and in the box they find only the two Kings. Moderato: Two cards disappear from the deck. One reappears face up and the other by spelling its name. Adagio: Four packets of cards reveal the selected card and then, reversed in the middle, the other three mattes of the selection. Sinfonia: You show the 5S and the 2S. The two cards change places. Then they change into the 5H and the 2H, and then their backs change color from blue to red. A stunning sequence. Spiritoso: You show three cards with backs on both sides. A card is freely touched in the deck, say the 7D. The three cards change into the other Sevens. Capriccio: A card is freely selected and signed. You take four indifferent cards (no selection). You draw a smiley face on the back of one cards. One after the other all the cards have smiley faces. At the end, only one card has a smiley face. The selected one. No force and it re-sets itself.